Not on my watch!… So declared Montana Senator Beauregard Bryant when the small town of Twin Rivers, Montana sought a lucrative federal contract to house Guantanamo Bay prisoners in its languishing prison. Undaunted, newly elected town Mayor Phoenix Jamborsky hires local lawyer Gabriel Lantagne to help secure the controversial contract against the wishes of the powers that be in Montana. But the nationally publicized issue lures a threat worse than bankruptcy towards Twin Rivers. Gabe slowly learns that the town s old secrets, Phoenix s ambition, and forces beyond his knowledge blur the line between friend and foe, and that Phoenix s prison plan has changed far more than the town s bottom line. As national politics and small town mysteries speed towards mutual resolution, the fate of Twin Rivers may not be decided by Senators, Mayors, and lawyers, but a young man from Pakistan with a politics all his own. The first chapter of Montanamo depicts a murder. Does it seem at that point that the murderer is evil? Does the murder make any sense based on what you can tell from that scene? Early in the novel one gets a sense of a the character of Phoenix Jamborsky. How would you describe her? Admirable? Strong? Scheming? Sheriff Pasquali is obviously a man who plays dumb. What are his motives? Are they pure or is it more complicated than that? As one begins to learn about Ahmed’s background, is he a sympathetic character? Can anyone become like him under the right (or wrong) circumstances? When do you first, based on evidence in the book, suspect that Ahmed’s trainers are hypocritical? Why? Is it possible that men who train boys to kill innocent people for political reasons have pure motives? Obviously, those training in the camp believe westerners unjustly murder their kinsman and deserve punishment for it. Are they wrong or is it all about who is on what side? Gabrielle is arguably the main character, but, compared to Phoenix, Ahmed, and Pasquali, is sort of along for the ride. Is he weak? Is it disappointing that he sticks with Phoenix until the very end? Who is the most admirable character in the book? Phoenix does what she has to do to get ahead. As she puts it, “its harder for women.” Are her actions justified? Does her ultimate success prove that they were? Would you trust her to be President? President Obama has been trying to close Guantanamo Bay ever since 2009, and, as of January 2016, it has not happened. Are you afraid that if the inmates from Cuba go on trial in the US it will spawn a terror attack? If you were a citizen of Twin Rivers, would you have voted for Phoenix’s plan? If you were Judge and Jury for Ahmed at the end of the book, would you set him free after all of his crimes? Did his ultimate decision vindicate him? Eric Jones reviews Montanamo on BookReview.com. June 2010. Featured in Book Guide Blog, BillingsGazette.com. April 2010. Hard-luck Montana town pushes to house Gitmo detainees, CNN.com. Smalltown USA’s Guantanamo hopes, Aljazeera.net. May 2009. Letter: Guantanamo detainees in Hardin present problem, Kimberly King, Billings Gazette. May 2009. 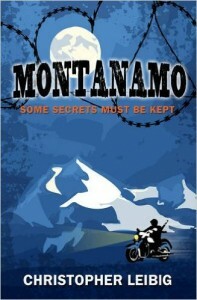 Montanamo one of 75 top selling Kindle books about Pakistan. January 2011.